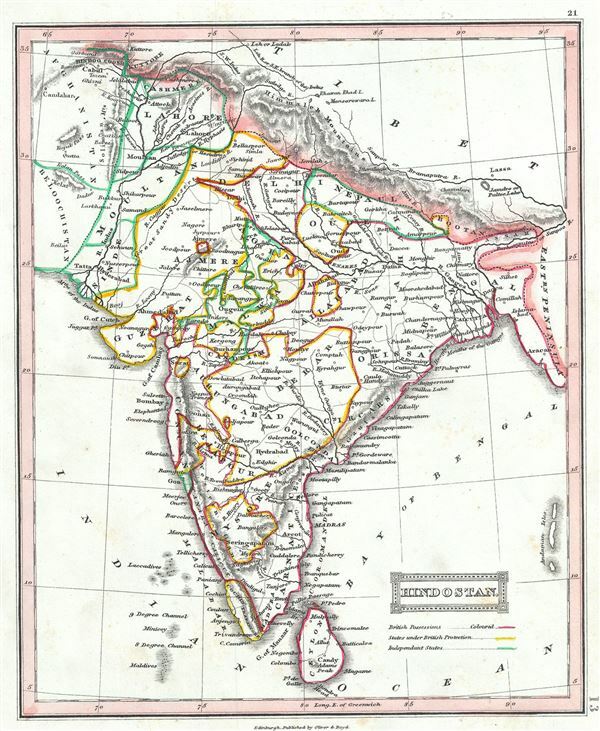 This is a lovely example of the Thomas Ewing's 1845 map of India and Pakistan. It covers the Indian subcontinent from the Indian Caucasus Mountains to the Indian Ocean and includes Ceylon or Sri Lanka and part of Kabul in Afghanistan. The map is coded with outline color according to territories under British Possession, territories under British influence by tribute protection and independent states. Various towns, cities, rivers, mountains, islands and several other topographical details are noted with relief shown by hachure. Most of India had, at this juncture, fallen under the control of the British East India Company. India, long an exporter of manufactured goods, instead became a supply house for raw materials to the British Empire. The Empire by this time had also started initiating the non-economic programs for education, culture, and social reform throughout the Subcontinent. Most historians consider this to be the true beginning of India's colonial period.Ã‚Â The East India Company ruled India until 1858, after which it was governed by the British Raj until it finally gained independence in 1947.